From a water main break in 2016. Water infrastructure issues have plagued the Town for years. It could be that Murphy’s Law could be applied to the Town of Luther when it comes to water, “if something can go wrong, it will.” It happened today when Town water was shut off just about the time all of the restaurants were in full lunch rush, and residents were doing laundry or needing to flush. Many of the restaurants had to close – the State Health Department frowns on not being able to wash hands and clean kitchens. The reason there was no water in Luther for a few hours on Thursday is one of the usual ones. Someone digging broke a line. 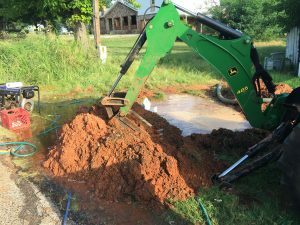 But what was determined this time, according to Mayor Jenni White, the contractor did what he was supposed to do, he called OKIE 811. Some of us might remember the public service announcements we used to hear on the radio or see on TV that warned everyone to “call Okie” before they dig. 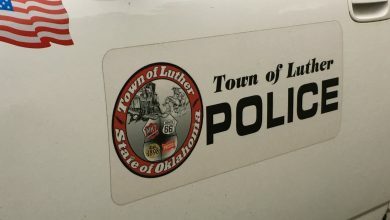 However, turns out the Town of Luther is no longer an OKIE member, having let its membership lapse. Who knew? Luther not listed. The town will renew its membership with OKIE 811. 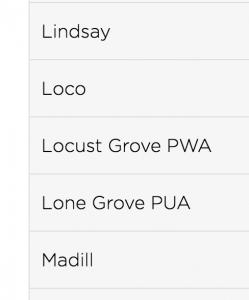 Looking at the website for OKIE 811, a state-wide “underground asset” locator for excavators and homeowners, Luther indeed is not listed among the municipalities in its membership directory. White said OKIE informed them that renewal notices had been sent in the past but never answered. And the relatively new Town leadership and staff did not know it was delinquent or was no longer a member. They know now. She said she knows it’s frustrating for everyone. “I hate it for the businesses and residents. I hate it that we look idiotic, but I hope people understand.” After water service was restored, she and Town staff spent a good part of the rest of the day working on water, from trying to rejoin OKIE, to grant planning and answering calls, some from upset water customers who lost revenue and productivity today. Late word the Town will shut off water again this evening for about an hour. WATER WILL BE SHUT OFF THIS EVENING! For approximately 45 minutes the water will be shut off again this evening to address an issue. We apologize for the inconvenience and thank you all for your continued patience. If you have any questions please do not hesitate to contact your Board of Trustees. There is a meeting this evening at the Community Center at 6:30 PM where questions can be addressed in a civil manner. The Luther Register plans to broadcast the meeting on FB Live.